At some point your veterinarian may recommend that your pet have an x-ray (technically known as a radiograph). This is a diagnostic tool that is very helpful to literally see inside your pet’s body. Examples of things that are commonly diagnosed with radiology include: broken bones, intestinal blockages or foreign objects, heart enlargement, lung conditions. This is often a vital step in helping your pet through a health problem. For example, if your dog or cat has been vomiting, an x-ray can help to determine if they have swallowed an object and require surgery to remove it versus treatment with medication and supportive care. If your dog is limping, the x-ray can differentiate a fracture from bone cancer from normal bones and joints. All of these health concerns require different treatments, so having the information allows us to best help your pet have an optimal recovery. We use a modern digital radiology system. A radiograph or ‘x-ray’ is a 2-dimensional, still image, created by passing x-rays through your pet’s body onto a receiver plate. The image created is detected by a computer, which develops a digital image that can be seen on a computer screen. Benefits of digital radiology: 1) faster turnaround time – the image is created within seconds and so the process of having x-rays taken is quicker for your pet, and getting answers is faster for you, the concerned pet owner. 2) A weaker x-ray beam is needed compared to traditional film x-ray images, this means less radiation exposure for your pet. 3) Digital images can go anywhere, so your pet’s x-rays can be seen on any of our clinic’s computers, and if necessary they can be emailed to a radiologist or another veterinary clinic quickly and easily, so there is little to no delay in information transfer. Your pet needs to lie still for a moment with the part of their body that is being imaged held in a certain position. Usually the same body part will be x-rayed from 2-3 different angles to help the veterinarian make a mental 3-dimensional image out of the 2-dimensional images created by the x-ray machine. Unfortunately, you cannot be present during your pet’s x-ray, since there is a risk of radiation exposure for you. 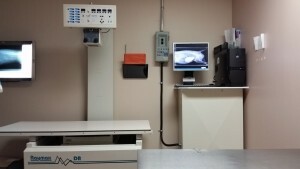 Your pet will be brought to the x-ray room and placed on a large table which is part of the x-ray machine. 2 or more trained staff or veterinarians will wear lead gowns to protect themselves from radiation exposure, and help move your pet into position and hold him or her still for a moment. Usually some verbal encouragement and praise helps most pets along. The machine makes a whirr and a beep, and the x-ray image has been taken. The veterinarian may see you and go over the results right away, or later by phone. Sometimes it is helpful in more complicated cases, to have a veterinary radiologist evaluate your pet’s x-rays, to get the most information out of them. The veterinarian may ask your permission to give your pet sedation, if he or she is painful, very nervous, or a very specific type of positioning is required (ie for hip dysplasia certification x-rays). Sedation is usually a combination of a drug for pain relief and a drug that makes your pet relaxed and sleepy. We only use sedation when it is absolutely necessary for your pet’s comfort or to ensure we can get x-ray images that are useful. Sedatives and sedative/pain relief combinations are specifically tailored to your pet for the utmost safety, based on their temperament, body weight, age, other medical conditions and how relaxed your pet needs to be. Some sedatives can be reversed right away so that your pet will no longer feel the effects, but most will gradually wear off over 4-8 hours. The veterinarian will advise you if your pet needs to be monitored in the hospital after sedation or if he or she can go home right away.